A 20% deposit is required after you receive the confirmation for your booking and the balance must be paid 60 days prior the tour date. If the reservation are made less then 30 days prior departure a full payment is required at the time of booking. Cancellations within 45 days notice: Your deposit is forfeited as a cancellation fee to liquidated damages and we refund you the balance. Cancellations within 44 to 31 days, 50% of your booking will be applied to liquidated damages and we refund you the balance. Cancellations within less then 30 days or no show: 100% of your booking will be applied to liquidated damages. If your participation in the tour is terminated for any reason at anytime during the tour, no refund will be given. 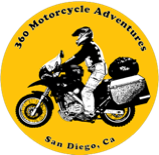 360 Motorcycle Adventures reserves the right to cancel any tour 30 days prior to tour start date. In the rare event of a tour cancellation, 360 will notify all tour participants immediately. 360 will either offer the tour as a Self-Drive Tour (route + hotel package) or will offer to operate the tour if all booked customers agree to a supplement charge. If customers do not accept to pay the supplement, 360 will refund their payment in full, which will constitute the full settlement. 360 is not liable for any additional costs or losses incurred by the tour participant due to 360 Motorcycle Adventures cancellation of tour due to lack of participation. This includes, but is not limited to the cost of pre-paid airline tickets, hotel reservations or automobile rentals. Situations may arise which will make it necessary for us to cancel, advance or postpone a scheduled tour, change itineraries or make substitutions regarding hotels, cities, tour guides and other travel arrangements. In that event, we do not assume responsibility or liability for any resulting losses, expenses or inconvenience. Your full tour price will be refunded if the tour is cancelled prior to scheduled tour start date. Prior reservation, you MUST check with your rental company for availability. Check with your motocycle rental company what they recommend, but we do the best we can to keep you riding in the tour. 360 Motorcycle Adventures are not responsible for any interruption of the trip. 360 Motorcycle Adventures is not responsible for punctures or damaged tires or tubes due to road conditions. We can assist the best we can to fix your tire our bring to a repair a shop at customer expenses. Customers are fully responsible for there own actions on and off-road. You have have the option to pre-paid the fuel for your tour, the charges are approximate and can varies from time to time. 360 reserves the right to charge an additional fee if fuel costs significantly exceed the average price per gallon at time of printing. We strives to schedule its tours at a time of the year when the weather in the touring area is typically pleasant for motorcycling. Many tours pass through areas where weather conditions can change very rapidly. 360 Motorcycle Adventures cannot be held liable for unpleasant and unsuitable weather conditions, and no refunds shall be granted for such conditions. Your Tour Guides are there to assist you while on tour and will do their best to ensure that every participant gets the most out of your tour experience. It is extremely important for all riders to listen carefully to the Tour Guide’s safety and travel instructions each morning to help ensure the best possible group riding conditions. Should you desire to travel independent of the group for any length of time, the Tour Guides can assist you in planning a suitable route. 360 ecommends that you take out adequate travel, health and accident insurance as well as Trip Cancellation Insurance.